Years ago, when my oldest child was a newborn, a friend of mine gave me a copy of the custom grocery list she used. She had found it online and started using it shortly after HER first child was born (who was only a few months older than mine). As the mother of a newborn at the time myself, I took the list, thanked her and then thought, “Yeah, right, I think my old list making method works just fine. 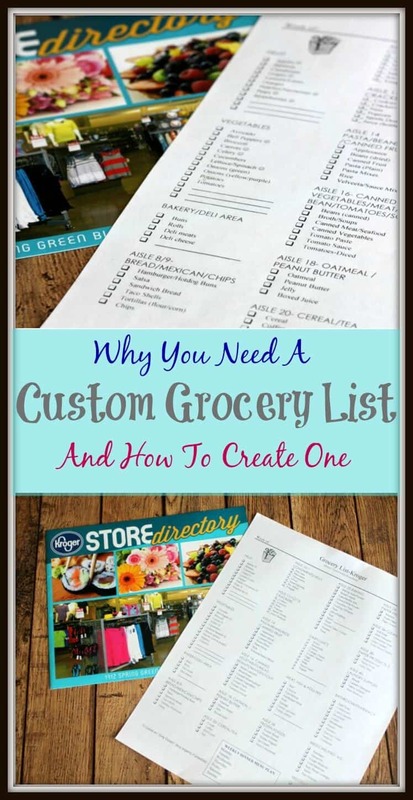 This seems way too complicated for me!” I’m not really sure what made me eventually try it, but now, well over a decade later, I’m still using an updated version of that custom grocery list. It really is such a lifesaver! It saves time. Imagine doing your weekly grocery shopping in under a half hour (sometimes in far less time—I think my record is 15 minutes!) 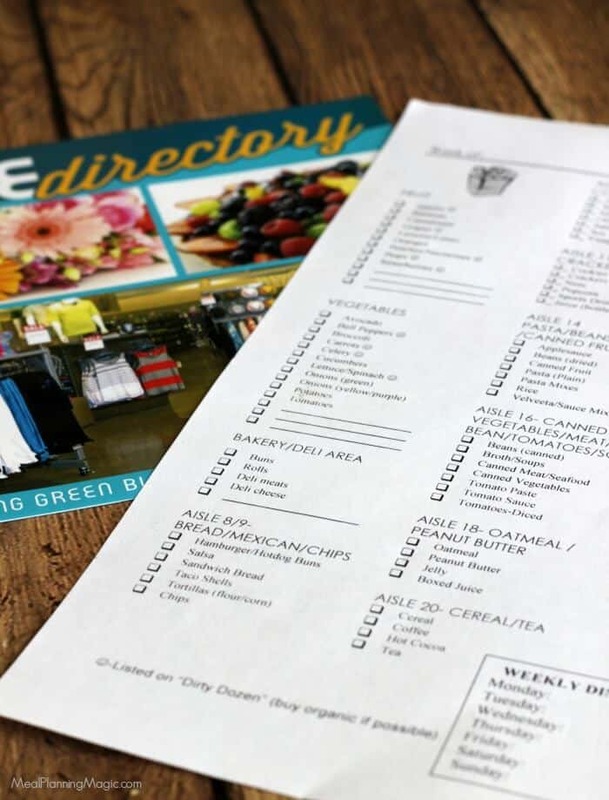 My custom grocery list has been set up by aisle number for the two stores I shop at most frequently (these are traditional grocery stores, not wholesale clubs or smaller stores like Aldi where it’s easier to find things already). That makes finding things a cinch and getting in and out of the store a lot more quickly! It saves money. This kind of goes along with my first point. If you’re only shopping the aisles you need to, you’re less likely to make impulse purchases which will save you money on your overall grocery bill. The whole family can help out. Now that my kids are older, I generally do the grocery shopping on my own. But I do keep a copy of the list hanging inside our pantry door so that when my family knows we’ve run out of something or want me to buy something extra, they put it on the list and know I will see it when I take it to the store. I’ll admit, it took awhile for them to get used to this practice but now they do it pretty regularly. How does it work? 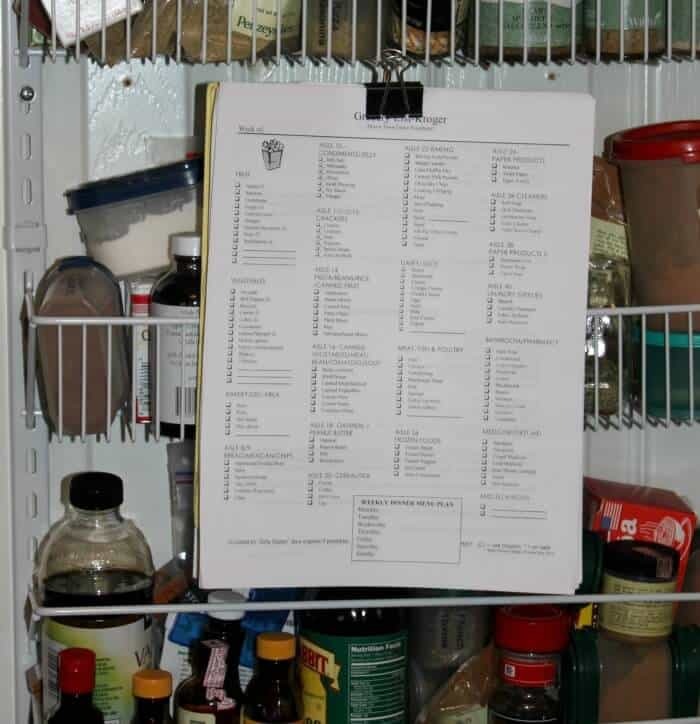 I just make up several copies of the list, clip together and hang inside my pantry. It saves sanity. If you’ve ever taken a whiny or fidgety child to the store, you’ll understand that getting in and out of the store quickly can be a challenge. 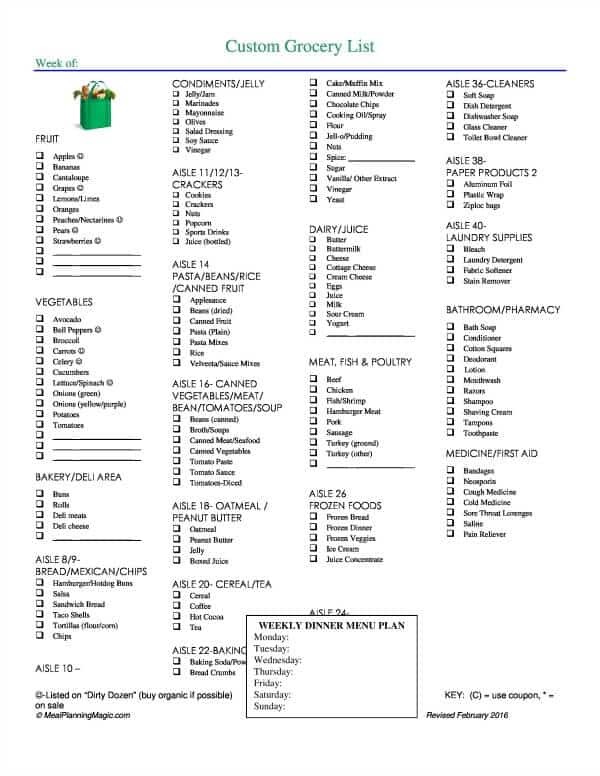 With the custom grocery list, you’ll only visit the aisles you need for the items you need and will spend less time dragging yourself and the kids from one end of the store to the other to pick up forgotten items.. For more tips on how to survive the grocery store with kids, check out this post. It helps with meal planning. One thing I like about this list is that it helps jog my memory on things I might not need for a certain recipe but I know we’ve run out of or are getting low on that might not have made it to the list otherwise. How many times have you been in the kitchen and interrupted by a crying baby, talking toddler or ringing phone? Scanning the list helps me remember to add those items that I’ve run out of but got interrupted before I could add it to the list at the time. When I am making my list, I scan each column and I’m more likely to check it off to purchase. Did we run out of carrots for snacking or salads? Oh yes, I did last night! Are we low on milk? Yep, add that to the list. Did I use the last of the peanut butter for lunches? 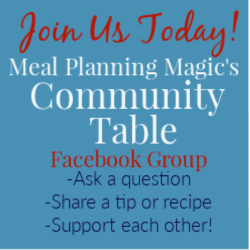 Yep, add it to the list too. . For more tips on meal planning check out my post here. On my list, I’ve also noted which items are on the Dirty Dozen list of produce that you should buy organic if you can. I also have a section on my list where I list the dinners we’re having each night. This helps jog my memory in the store of something I might have forgotten or just wonder “now why am I buying this ingredient” and helps me figure out what size I need if it’s not noted on my list. I’m not going to lie, creating a custom grocery list takes a little bit of time upfront, but the payoff is great in the end it is worth the effort. I promise! As the customer service clerk for a copy of their store layout. Most stores have this available and it lists the most commonly purchased items aisle-by-aisle. When a store first opens or does a remodel, they will usually have them available in more places but generally, you can get one from customer service if nothing else. If your store doesn’t have a list like this, you can do it yourself. Yes, this takes time but most stores have a brief listing of items on the aisle numbers hanging above the aisles. Use this as your guide. Take the list and sort it by category. You can do this with a pencil and paper or if you’re computer savvy, put the information into a spreadsheet so you can sort it more easily by aisle or item or both. Don’t forget to add the produce you purchase most often as this is usually pretty broad on the store list. Use a grocery store list template. I’ve got one here for you that will help you get started. You can use it as a guide to create your own list. I created mine in a Word document with columns but you can set yours up in a table or use your favorite word processing program. Tweak it in the coming weeks. When setting up a new store list, it often takes me a few trips to the store before I have everything on the list I purchase most often and in the right place. Know that you might need to make a few edits. But what about phone apps? Yes, there are several grocery shopping apps now that let you customize your list by aisle for the store you shop at most often. I have not tried these out too much yet but I plan to. The one thing I will say is that having a list that everyone in your family can add to is helpful so if nothing else that’s one reason to have at least one paper copy available (maybe you could laminate it and use it week-to-week). One other thing to note, have you ever been stuck behind someone in the store whose face is buried in their phone? I don’t know, there’s something about those little tiny screens that can make it trickier to see what you need. Maybe that’s my age talking! I do plan to check out the apps and let you know what I discover in a future blog post! I hope you’ll give a custom grocery list a try and let me know how if it really does simplify your grocery shopping!